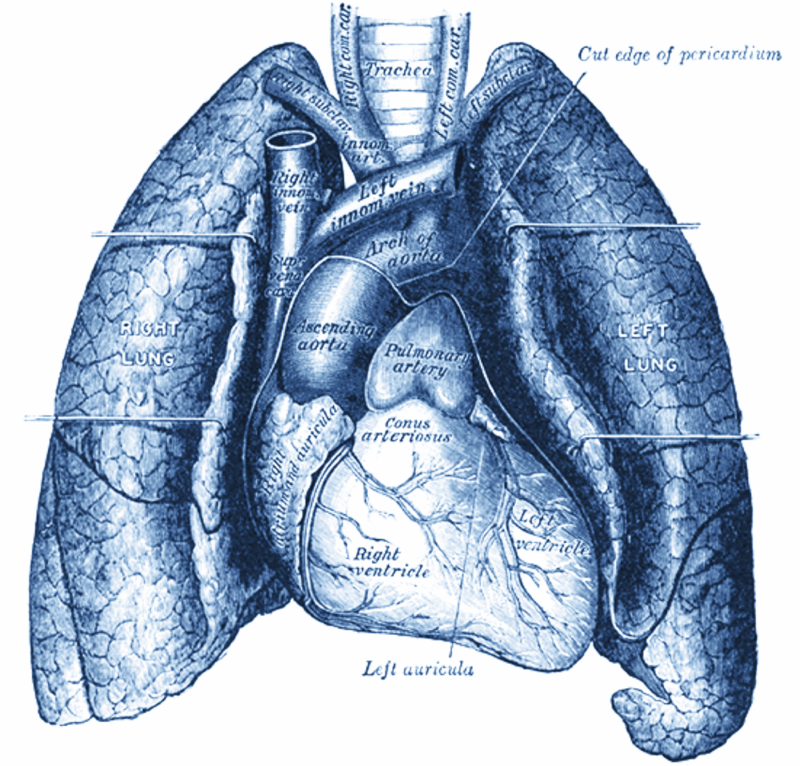 Gray's Anatomy: Heart and Lungs. 1918. Public domain via Wikimedia Commons. Last month, I put myself into respiratory distress. It started with tightness in my chest, like an elephant was sitting on my breastbone, but I dismissed it as anxiety. I had some trouble at the gym, but I figured I was just tired. It was midterms season; everyone was tired. I got a little bit concerned when I began having a hard time walking to class. Eventually, I started awkwardly gulping down air as I was talking to a friend, so finally I pulled out my phone. My doctor, a motherly Bulgarian woman, answered. “Hannah, honey, what’s happening?” I strained to understand her accent over the static. “Hey, Dr. H. “ Everyone calls her Dr. H. Her last name is unpronounceable, with vowels and consonants stacked in ways our American tongues have no hope of saying. I expected her response, but that didn’t make it any easier. I stuffed some clothes in a bag, knowing if I didn’t pack then I would definitely be admitted—Murphy’s Law is strong in hospitals. My soul hurt more than my chest as I called my mom and explained the situation to her. I hate putting my parents through this. Last year, my mom broke down in the middle of security at the Atlanta airport, sobbing. The TSA worker awkwardly patted my mom’s hand as she raised her eyebrows at me. “We just got some bad news,” I explained. We had gone to Atlanta to see a renowned geneticist, who diagnosed me with mitochondrial disease. Mitochondria are the microscopic organelles that produce almost all of the body’s energy. Mitochondrial disease (or “mito,” which rolls off the tongue better) is a genetic disease that cripples them, so different organs don’t get enough fuel. In my case, it mostly causes trouble with the brain, muscles, and stomach. The problem that sent me to the hospital that day was my muscles. Apparently, they were so weak that even breathing was too difficult. Mito is progressive. I have a mild case, so my doctor says that she thinks I’ll live to old age. I don’t really believe her; there are a lot of years until I get old, and I’ve known way too many people with mito who have died far too young. The uncertainty is hard. There aren’t cures or real treatments yet, either. Some treatments are in the early stages of development, but today there are only supplements of questionable efficacy. So right now, all that can really be done is make my symptoms as easy to live with as possible. I walked into the ER, slightly dazed. It’s always so strange to me how this whole different world, the sick world, is a few minutes from school. I gave my name to the receptionist, who motioned to a nearby nurse. She whisked me straight back to a bed, past a dozen people in the waiting room who were giving me the stink-eye, jealous that I didn’t have to wait. Sometimes mito has its advantages. I turned around and glanced at the monitors. Everything looked excellent; my body was compensating perfectly, so my oxygen levels weren’t low. I breathed a sigh of relief, thinking that I could maybe escape admission. The ER doctor came in with a hospital volunteer that was shadowing her. The volunteer and I looked at each other awkwardly; she was a UNC student too. She looked pulled together in a crisp volunteer uniform, while I was lying there in a hospital gown, suddenly aware that my hair was a mess and I had no make-up on. The power differential was strange. The doctor examined me, listening to my breath and whacking my legs with the reflex hammer. Then she and the volunteer left, giving me no answers or decisions. I started reading a book for my Public Policy class and spent a few minutes muddling through jargon so dense that it might as well have been Portuguese. Abruptly, on a whim, I closed the book. I was in the hospital for studying too much; I decided that was as good an excuse as any for taking a breather. Suddenly, an enormous wave of fatigue came over me, engulfing my body and mind in sludge. It was as though I had been trying so hard to keep my fraying seams knitted together that once I gave myself permission to rest I came completely apart. An hour of mindless websurfing later, the ER doctor came back. A few hours later, a scruffy-looking tech took me up to my room. After a lot of bargaining on my geneticist’s part, they put me in pediatrics, which I greatly appreciated. I prefer being around cute kids to old people. My parents walked in, bearing dinner. My dad joked that he secretly loves it when I’m in the hospital: it’s a great excuse to see me. After dinner, they both settled in with their laptops, working like always. I knew my parents didn’t mean to pressure me. They’re the ones always trying to get me to slow down; I think I’m the only kid ever whose parents tell her to do worse in school. But I grew up steeped in Jewish academic culture, and defective mitochondria don’t erase that. Soon my geneticist walked in, smiling wisely. They kept me inpatient for two more days, dripping liter after liter of sugar water into my veins. Slowly, I could breathe again, and that fatigue sludge coating me lifted. I didn’t open a single textbook or write a single essay in the hospital. Instead, I probably watched a thousand episodes of Law & Order. I left the hospital on a Friday afternoon, returning to the healthy world. A beautiful Carolina blue sky was above me. I took a long, wonderful, post-hospital shower then trekked to Academic Advising, where I dropped down to taking ten credits. As I signed the form, the strangest combination of emotions washed over me. There was sheer frustration at my body, guilt that I couldn’t measure up, but most of all an enormous sense of relief. Finally, I could breathe. I’ve always tried to be perfect, to not make mistakes. But this time, being perfect was my mistake. I learned a harsh lesson about moderation during that hospitalization: I can’t do everything, and I certainly can’t do everything well. Once in a while I feel like I’m lucky, though, that I now have this line drawn in the sand. I see my friends running themselves into the ground, with classes and work and clubs and what-have-you, never stopping for breath. Sometimes, I just want to tell them to take a load off and watch some Law & Order.